After spending decades in the workforce with most of your days already planned out for you, retirement is a huge adjustment. Now you finally have a chance to do all of the things that your busy schedule kept you from doing! In spite of the increased freedom, some retirees are surprised to find that they actually miss their working days. They may feel isolated or that their sense of identity or purpose has diminished. If this is true of you, it doesn’t have to be that way! 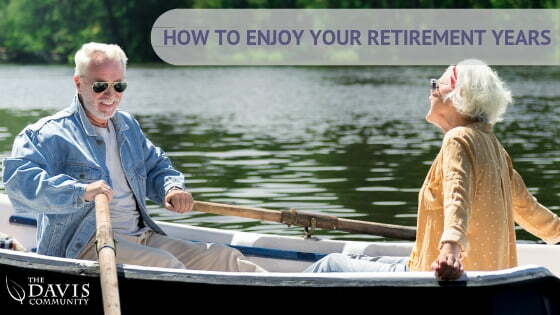 The following tips can help you find joy and purpose in your retirement. When you’re working and raising a family, there’s not a lot of time left over for hobbies or other personal pursuits. All of that changes when you retire. There are so many ways to keep busy and find personal fulfillment in your retirement. It’s the perfect time to pursue hobbies like golfing, fishing, gardening, or crafts. But the options don’t end there. Some retirees decide to find a fun part-time job. In addition to adding to your income, this is a great chance to try something new that may not have been an option when you had more financial responsibilities. You may even be able to use the knowledge or skills that you have gained to start your own business. If you love traveling, retirement can offer you the chance to explore far-off destinations without the constraints of limited vacation time. The need to stay active and eat a balanced diet doesn’t diminish with age. Whatever your retirement schedule looks like, be sure to include time to exercise regularly and eat nutritiously. Taking care of yourself also means recognizing your limitations. If you find that certain tasks, like shopping, laundry, or cleaning are becoming more difficult, you may want to consider getting some help. A home care service can help you take care of the things you need to do, which means you’ll have more energy left for time with family and friends or anything else that you find personally fulfilling. Meaningful relationships play a large role in your overall health and happiness at any age. Social connections help you avoid feelings of loneliness, isolation, and even depression. And since our emotional and our physical health are connected, they can keep you healthier physically too. When you were working, chances are it was pretty easy to maintain social connections. Conversations over lunch with co-workers, company parties, and normal day-to-day interactions make it easier to form bonds with those you work with. After retirement, you may have to work a little harder to avoid becoming isolated. Make plans to spend time with friends. Meet for an occasional cup of coffee or game of cards. Social Media can be a great way to interact and keep in touch with friends or family who don’t live nearby or whose schedules make it more difficult to spend time together face to face. Joining a club, volunteering, or taking a class can all be great ways to make new friends. They offer you a chance to meet new people with interests that are similar to yours. What starts out simply as common ground could grow into a deeper friendship. Have you always wanted to learn to play a musical instrument? Or maybe you always wished you had time to take up photography or to perfect your baking skills. Did life get in the way of your dreams to earn a college degree? It’s never too late to learn something new! Retirement can offer you the freedom to take classes or to simply do some of your own research and teach yourself something you’re interested in. Learning something that you’re excited about can give you a sense of accomplishment and purpose. And keeping your mind active can even decrease your risk of developing certain cognitive impairments down the road. Nothing can sap the joy out of retirement like worrying about whether you’ll be able to meet your basic expenses. If you’re living on a fixed income, set up a budget and stick to your limit. If you’re spending down your nest egg, research the withdrawal rate that you need to stick to. Even if your budget doesn’t allow you to take that dream vacation or purchase the home of your dreams, you’ll be much happier sticking to things that bring you joy without putting you in financial trouble. Some people are quite happy to spend their retirement in the home where they raised their family. Others decide that they just don’t need that much space anymore. There are several possible advantages to downsizing or relocating. If you’ve built up a lot of equity in your home, buying a smaller house or moving to an area that’s a little more affordable is one way to increase your retirement savings. A little extra money could allow you to enjoy some things during your retirement that may have otherwise been out of reach financially. Another reason some decide to relocate during their retirement is to increase their freedom. Maintaining a home is a lot of work, and the upkeep often becomes more difficult with age. Trading a large house and yard for a smaller home, a condo, or a place in a senior community can save you considerable time and energy. It also offers the peace of mind of knowing that, even if you experience a change in health, things around your home will be taken care of. If you or loved one are no longer capable of living a safe, independent lifestyle, then call the Davis Community today at 910-686-7195 or simply complete and submit our online information request form. We provide exceptional assisted living and skilled nursing services in Wilmington, NC. We offer a strong and supportive environment where your loved one will feel welcomed and part of an active community. Davis Community is pleased to offer customized concierge home care services, including meal preparation and nutritional guidance, to independent seniors living in Landfall, Cambridge Village, Wrightsville Beach and Porter’s Neck, NC. Get to know the difference today — schedule a visit to the Davis Community! Join Connections, our community outreach program to receive updates on the latest industry news and events in the area.